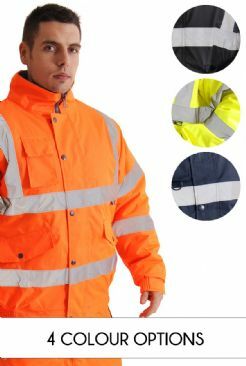 This quality high visibilty bomber jacket available for a fraction of the retail price features two-way zip and popper fastening, elasticated cuffs and waistband, two side button pockets, mobile pocket to chest, quilted lining, fully taped seams, an inner breast pocket, fleece collar lining and a concealed hood with drawstring. Conforms to EN 471 Class 3:2. Conforms to EN 343 Class 3:1. (Orange Only: Conforms to GO/RT 3279). Waterproof. 100% Polyester with PU Coating. Lining: 100% Polyester. Machine washable (x25 wash cycles). Not Sure Which Size Are You? View Our Size Guide!